From plumbing for a sink or reworking the plumbing for your new shower, our licensed plumbers on staff will take care of all of your plumbing remodeling needs. We rely on water for life, but water can also cause a lot of damage when plumbing is not done properly. Our plumbers work hard to do a clean job and to make sure that you are water-tight when we are done. 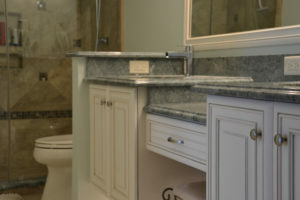 We install new commodes or reconnect plumbing to new sinks and fixtures with new shut-off valves. We hook up new dishwashers and run new water lines for refrigerators. In houses, we can sometimes move major fixtures, such as tubs or commodes, to allow for a more efficient and open layout. We help you pick out fixtures and accessories that will help to complete the look of your kitchen or bathroom project. Don’t take chances when it comes to water. Trust Cornerstone’s plumbers to take care of all of your plumbing remodeling needs in your home remodeling project.